Greg Palacio is a Garifuna, Belizean visual artist/musician who has relocated to Las Vegas. His works have appeared in galleries throughout the United States and his home country. In 1992, Greg joined forces with the celebrated African-American photographer Dennis O. Callwood at the Black Gallery in Los Angeles and his watercolor paintings were the focus of the one-man art exhibit in the Pasadena Public Library. 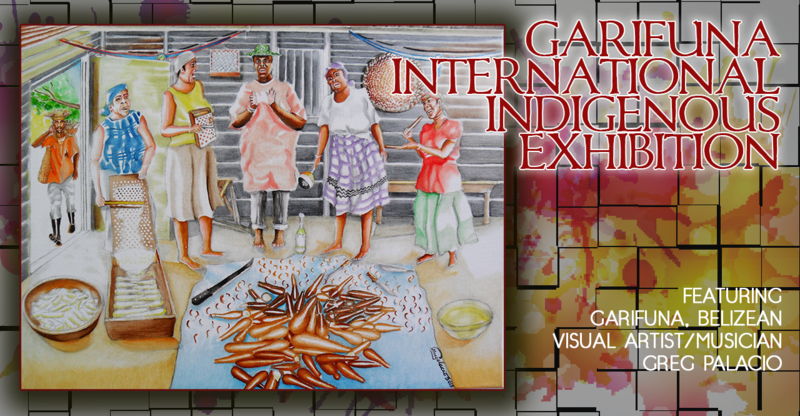 At the invitation of the government of Belize, in 1994, he displayed his art at the Baron Bliss Institute for NICH. Palacio’s work was featured in an exhibit held in conjunction with screenings of The Garifuna Journey by Andrea Leland at the Chicago Fields museum plus Cambridge University in Boston and also did the graphics in the film Yurumein. 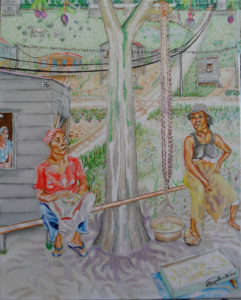 He won first place in a competition for fine art of the Americas and the Caribbean called Vision 2000. GP’s cultural calendar, postcards and the album covers that he has produced for Punta Rock, Soca, and Reggae artists have exposed his art style internationally. His body of work was included in the tribute to artist for peace Andy Palacio at the Realto in Atlanta. Greg was featured by the Caribbean Heritage Organization in 2011, Universal Studio city. In 2012 he opened for a group show with other Belizean artists at the Bze embassy in LA and in 2013 also conducted an art workshop in Washington DC, for Smithsonian. In 2017 GP did a one man exhibition at City Lights Gallery in Henderson, NV where he included the touring HS dance ensemble from Dangriga, Belize “Lirahunu Satuye”. 2018 was his breakout year because he released his solo CD named Méisturu(Teacher) that’s available on cdbaby, iTunes & Amazon. Palacio has done book covers for Mr. Francis Arana, The Garifuna Teachers also collaborated with Ms. Carr on The River Returns: a ‘Garifuna Tale’ and Reverend Sheppard’s Widow. In 2019 he was invited to do a presentation for the oldest watercolor society in Nevada. Greg Palacio currently teaches art for Grumbacher at Michaels.